Sometimes, you can see something so beautiful that it invades your imagination forever. 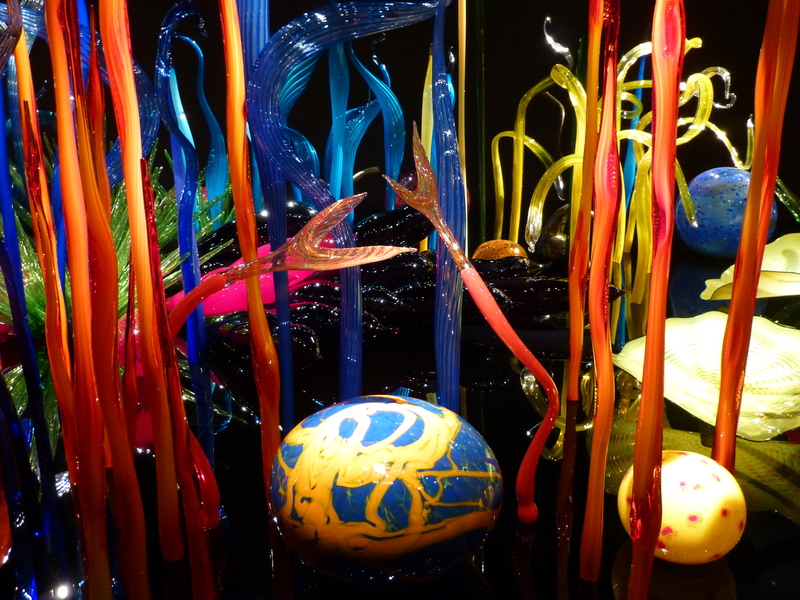 I have been a fan of Glass Artist Dale Chihuly for years, but have never seen a comprehensive exhibit of his large scale works in person until I had the opportunity to visit Chihuly Garden and Glass during my recent stay in Seattle. 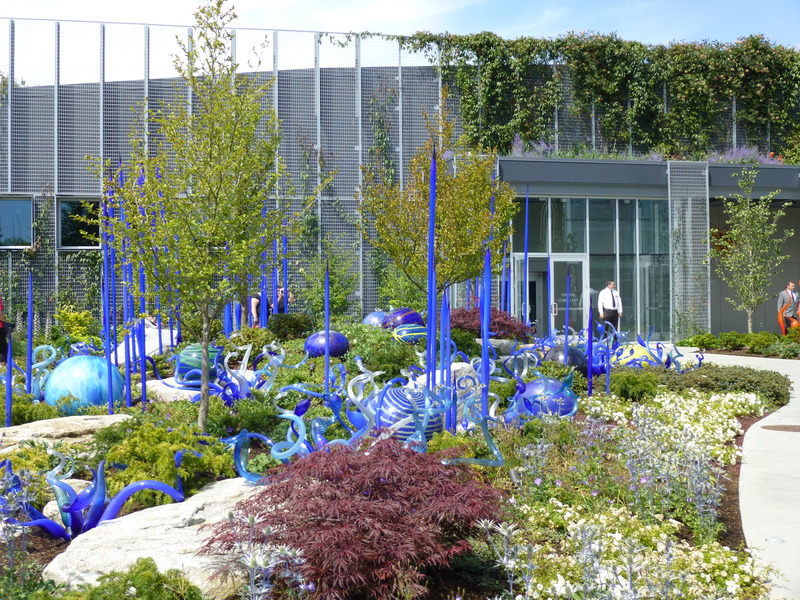 While it is inarguably a beautiful city with innumerable natural attractions and tourist destinations, if you can visit only one notable spot on a trip to Seattle, go to Chihuly Garden and Glass. This place will completely and totally blow your mind and it is absolutely unlike any attraction you can see anywhere else. 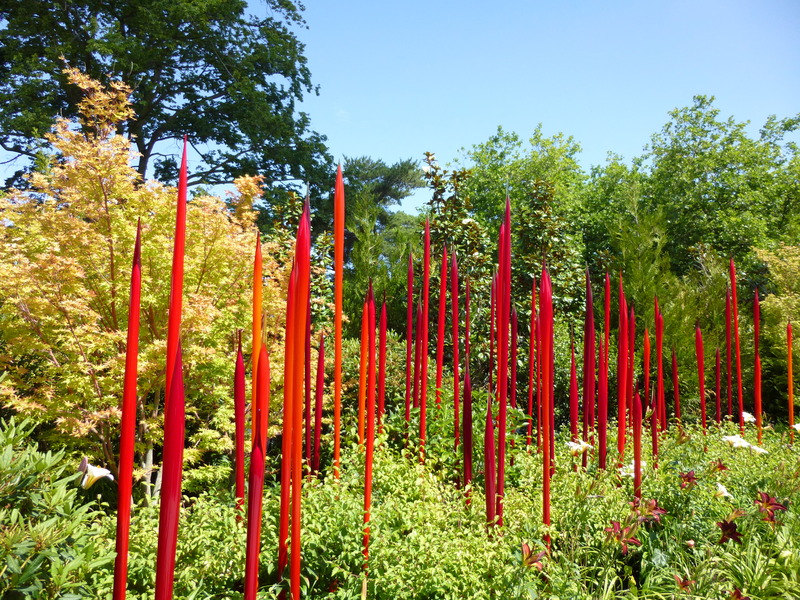 I have been to museums and botanical gardens of all kinds all over the country, but have never before seen works of art and nature as consistently gorgeous as I did at Chihuly. 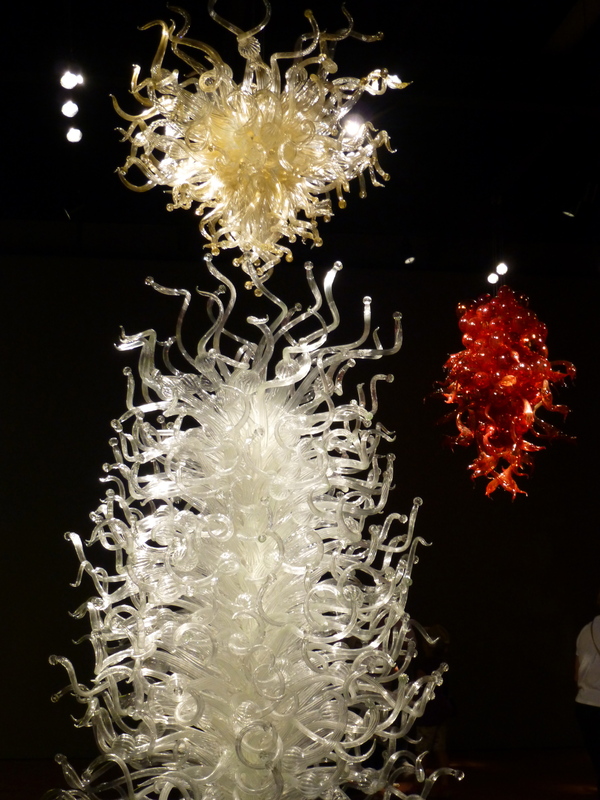 Made up of eight exhibit galleries, a theater, a glass atrium and an outdoor garden, the “Oh Wow” factor of Dale Chihuly’s magnificent glass works is just insane, but I am going to let some of the photos I took during my visit do most of the talking. 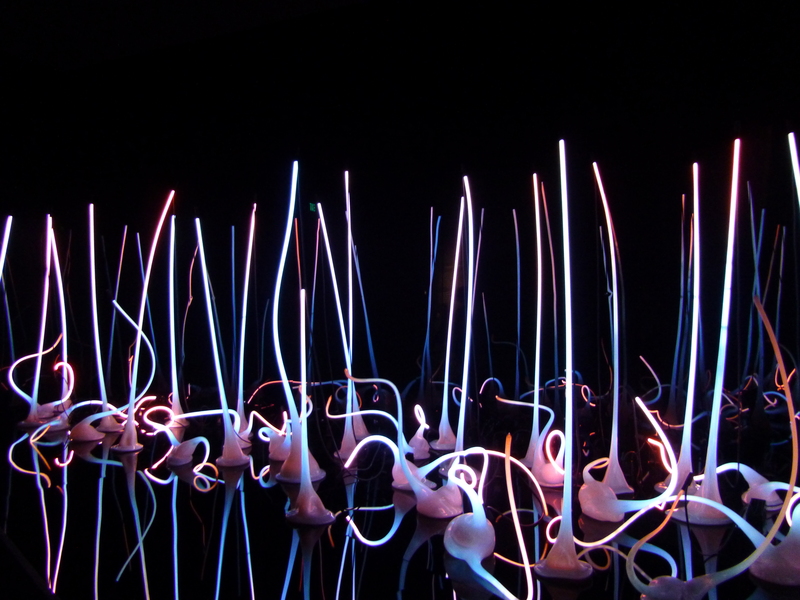 After passing through an introductory hallway where you can read brief, informative paragraphs on the history of Dale Chihuly’s career, you will come to the Glass Forest, the only Gallery in the museum featuring glass pieces where artificial light (in this case, neon tubing) is incorporated into the glass. 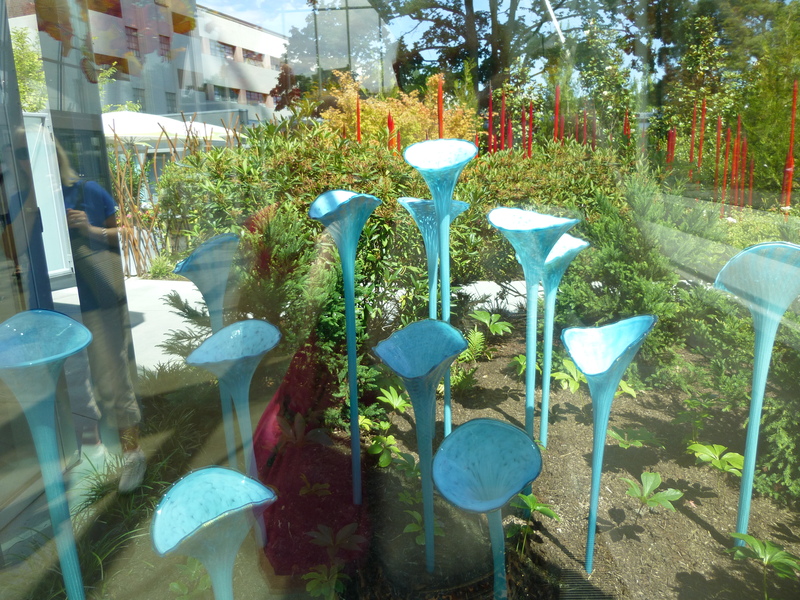 The Glass Forest installation is so beautiful, it took my breath away. I could not even imagine how much more amazing it would get. 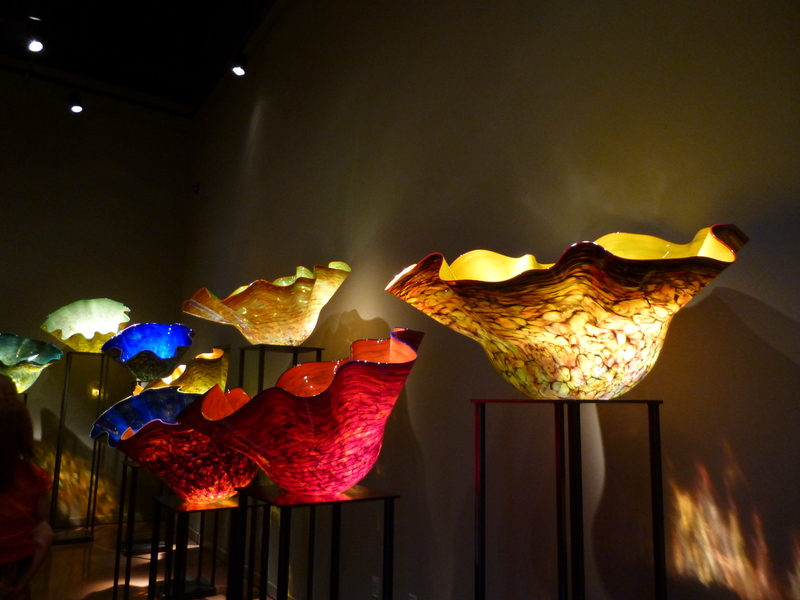 Each stage of Chihuly’s work represents a series, and in the Northwest Room you can see the glass baskets he created based on traditional woven baskets made by Native Americans. 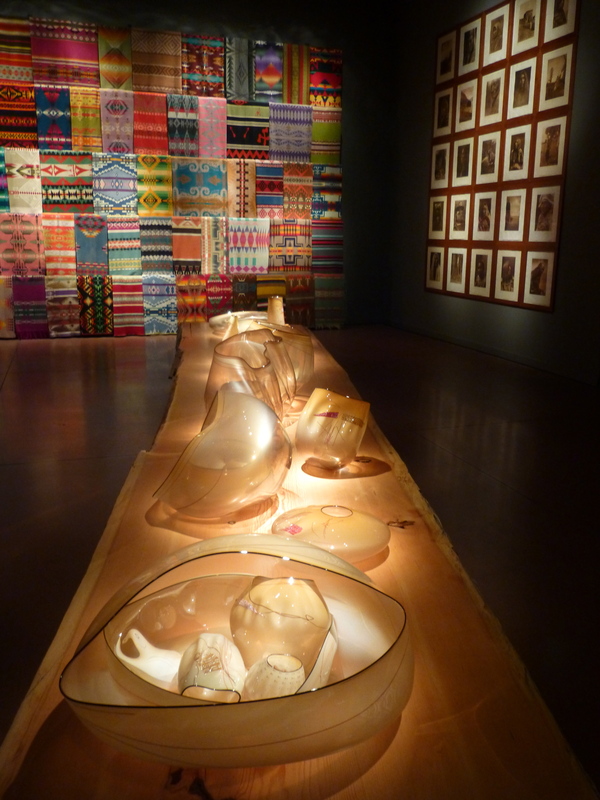 The Northwest Room also contains a small cross section of Chihuly’s extensive collection of gorgeous Navajo Blankets. 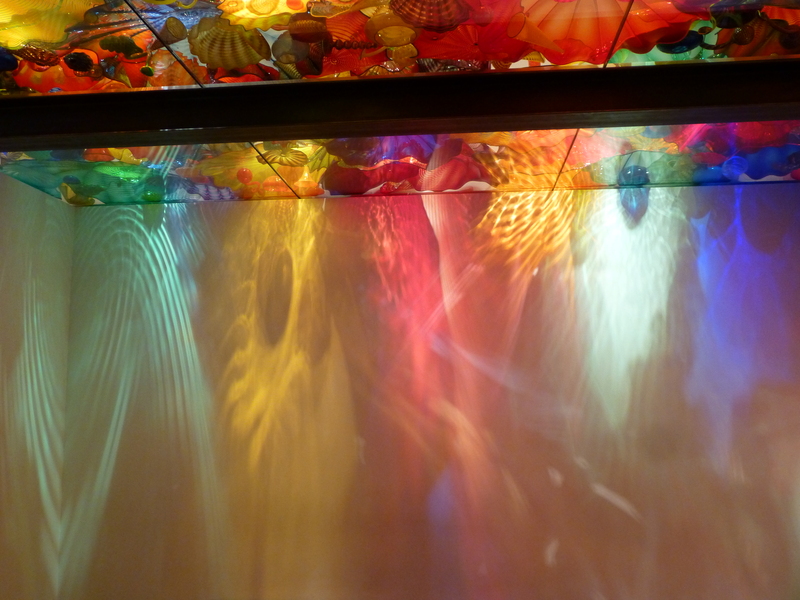 The Focal Point of the Sealife Room is a ceiling-high blue glass sculpture dotted with pale amber blown glass Sea Creatures. 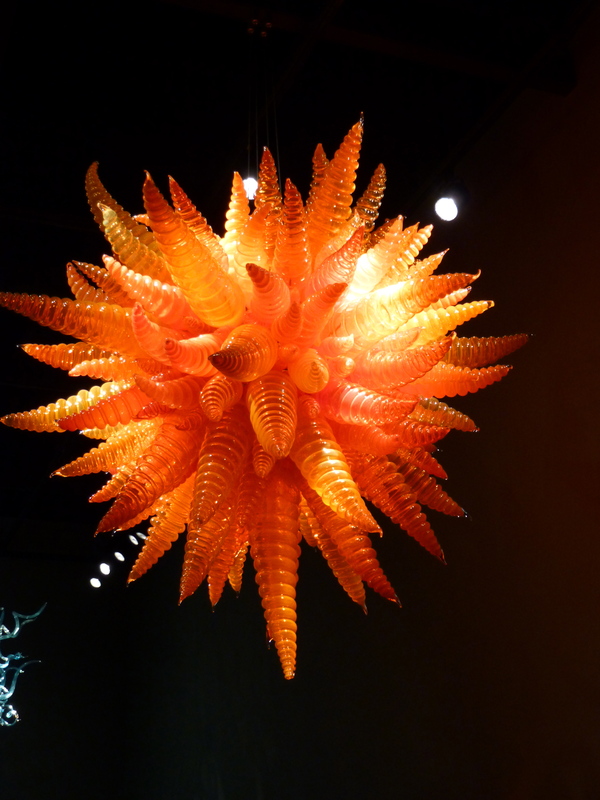 This large piece is a good example of the modular nature of Chihuly’s sculptures of this type, in which individual glass limbs or bulbs are hung on a central, grid-like pole. 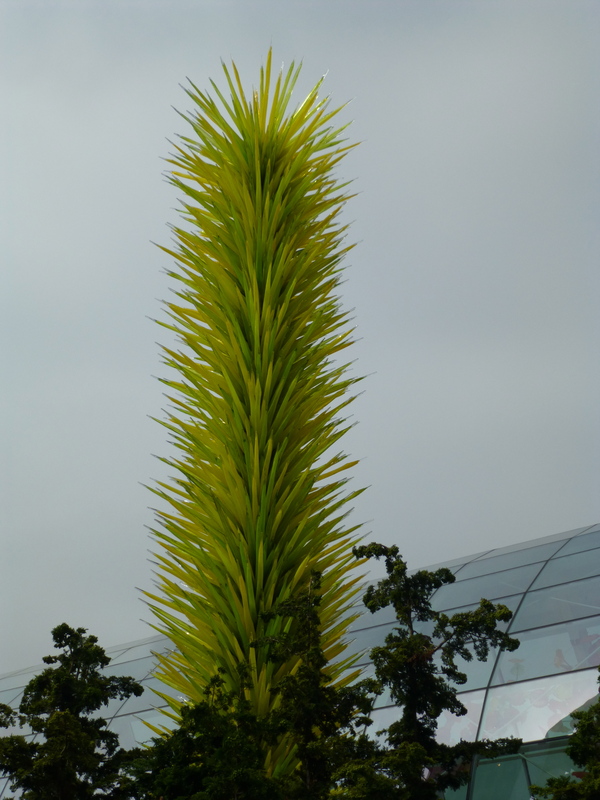 This type of construction allows each installation to be site specific. 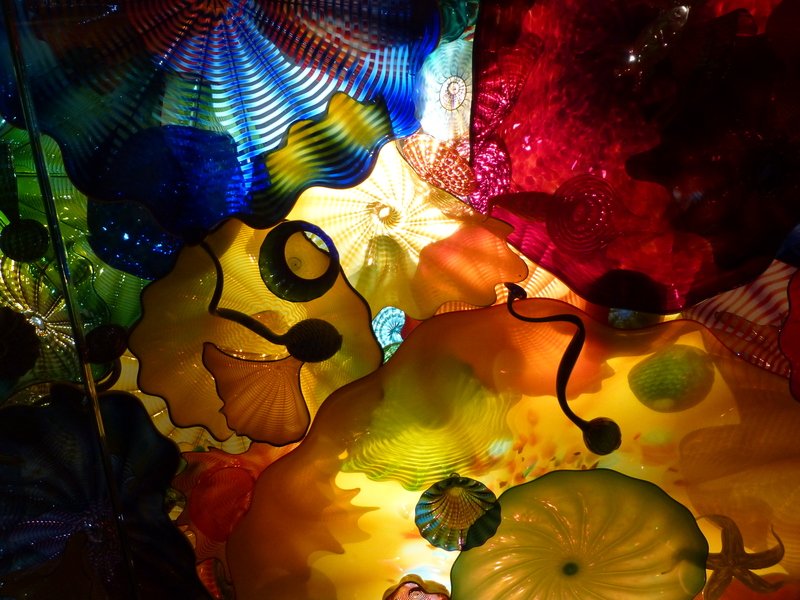 Thousands of pieces of blown glass of all shapes and colors reflect their beauty behind the glass panels of the Persian Ceiling gallery. 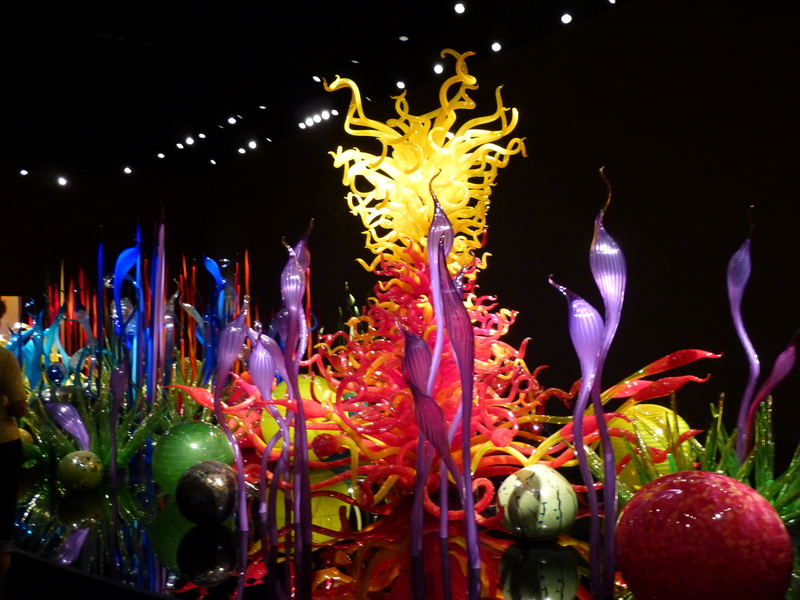 The Mille Fiore (Thousand Flowers) Gallery is an indoor garden of otherworldly delight. I think I took a thousand photos in this room alone. 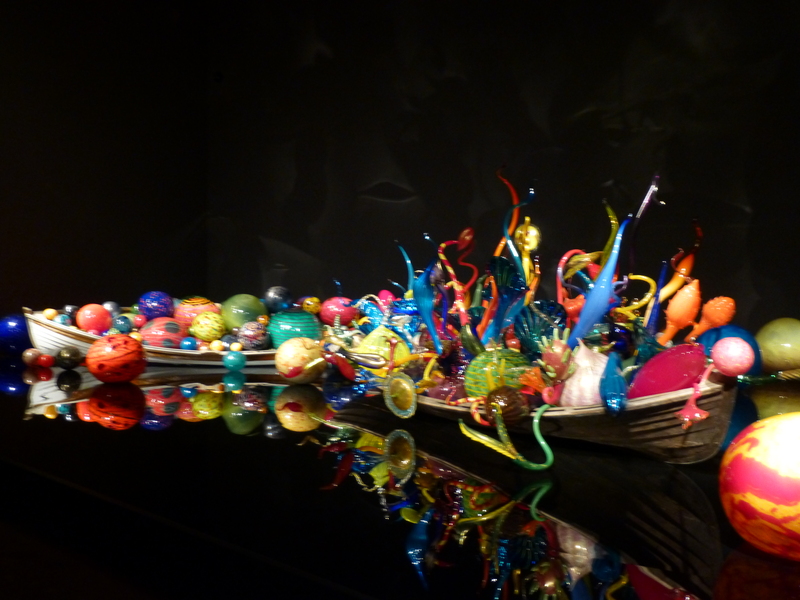 The glass pieces in these two boats represent works inspired by fishing floats and also the Japanese art of Flower Arrangement known as Ikebana. 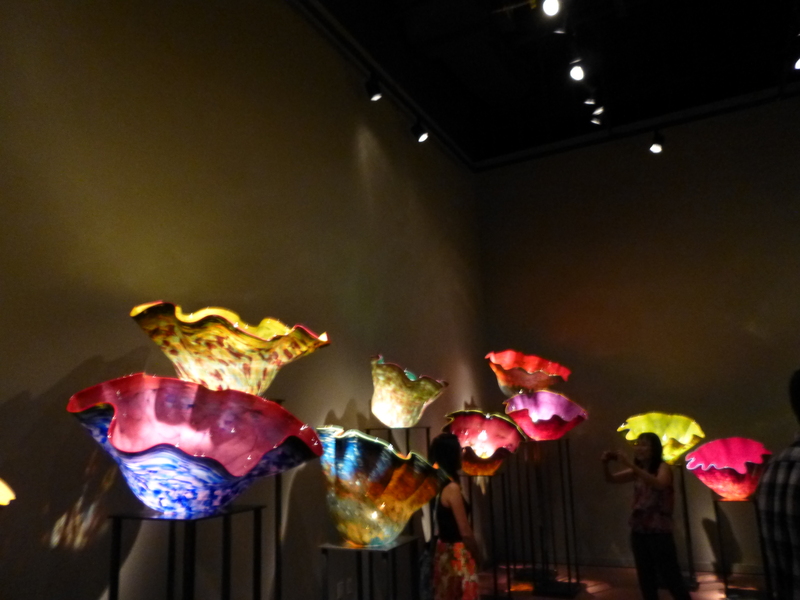 The Chandeliers in this gallery were previously included in the 1996 exhibit, Chihuly Over Venice, where Chandeliers were hung adjacent to or over the canals in Venice, Italy. 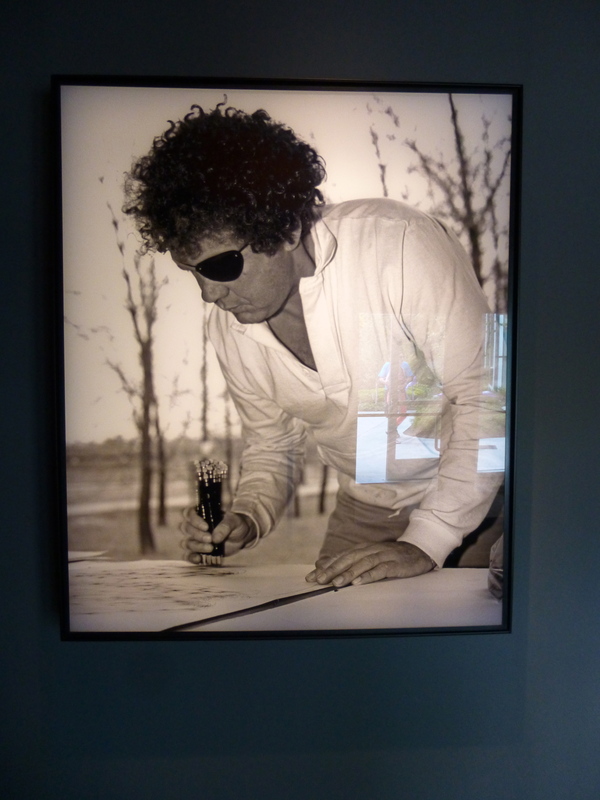 At the end of the indoor galleries there is a small theater where you can sit and watch a series of fascinating short films about Chihuly’s many ambitious projects including those in Las Vegas, Venice, The Citadel in Jerusalem and Finland. Do yourself a favor and watch all of them. 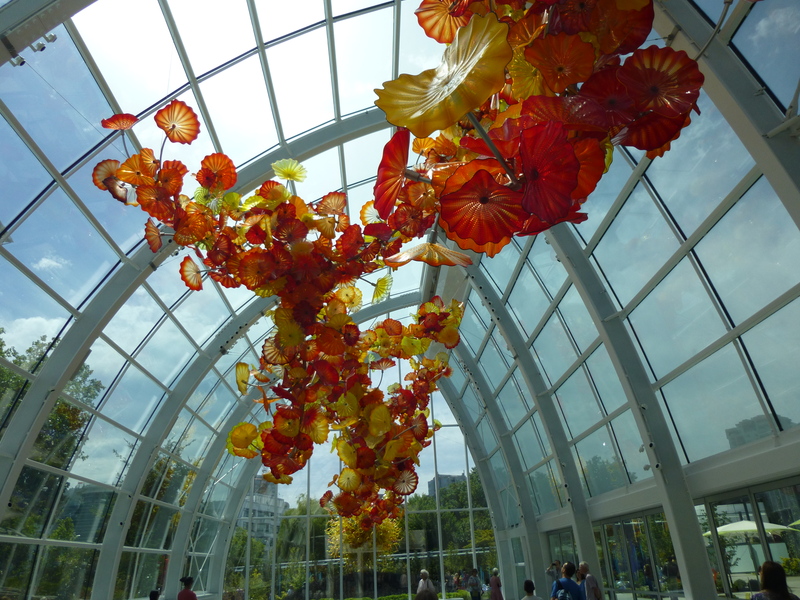 The centerpiece of Chihuly Garden and Glass is the Glasshouse, a 40-foot tall, glass and steel structure covering 4,500 square feet of light-filled space. 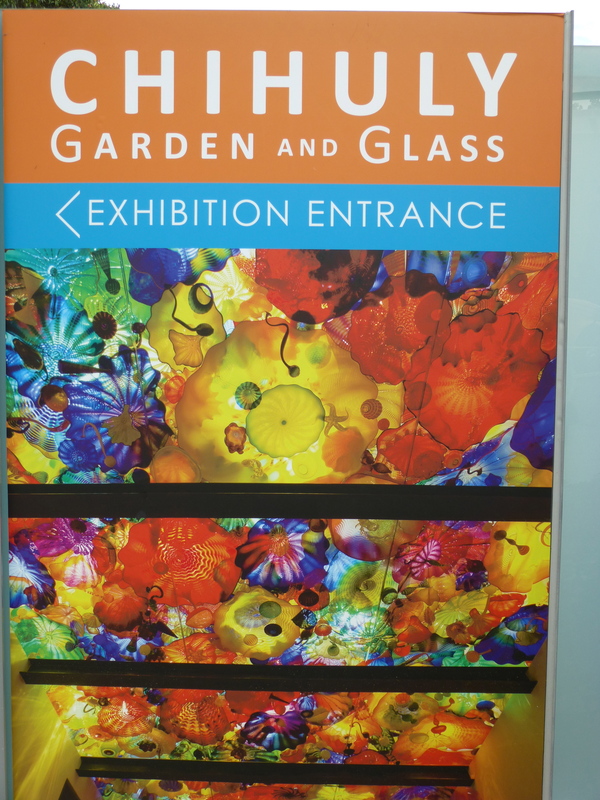 The Glasshouse – the result of Chihuly’s lifelong appreciation for conservatories – draws design inspiration from two of his favorite buildings: Sainte-Chapelle in Paris and the Crystal Palace in London. 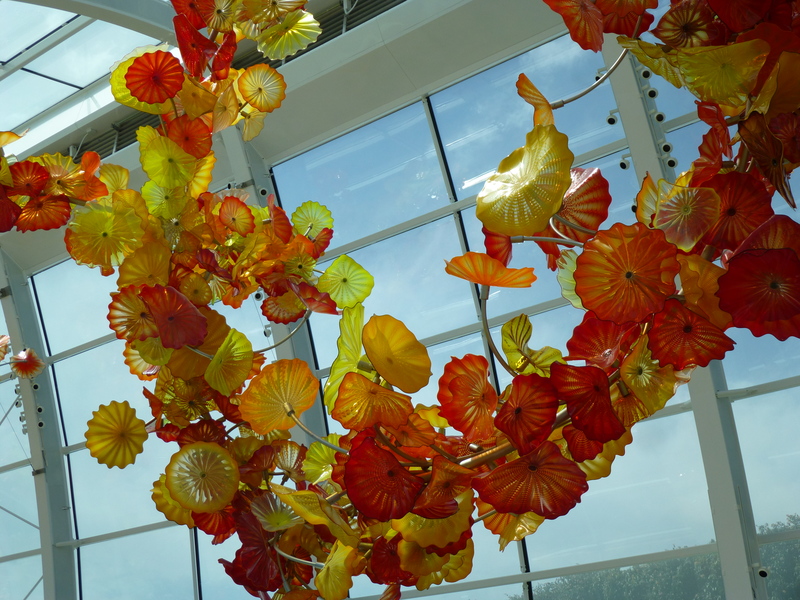 The installation in the Glasshouse is an expansive 1,400-piece, 100-foot long sculpture in a color palette of reds, oranges, yellows and amber. 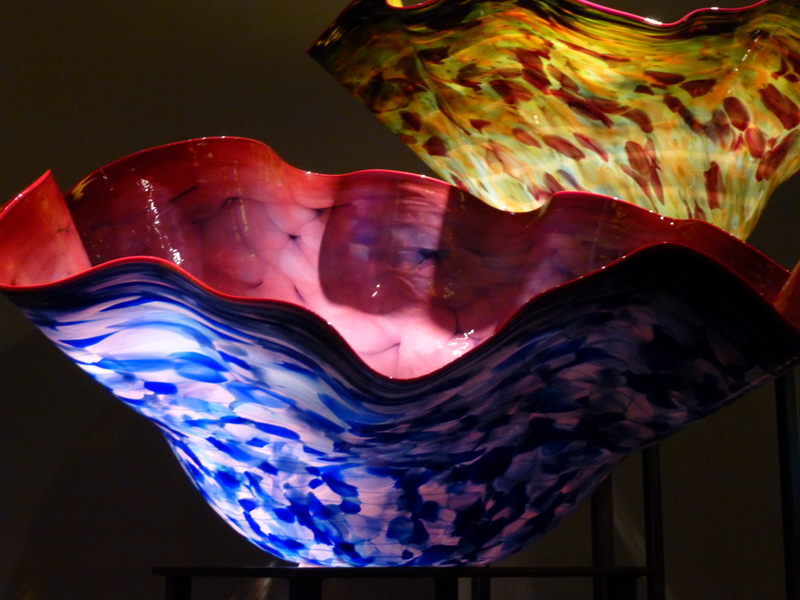 Made of many individual elements, it is one of Chihuly’s largest suspended sculptures. 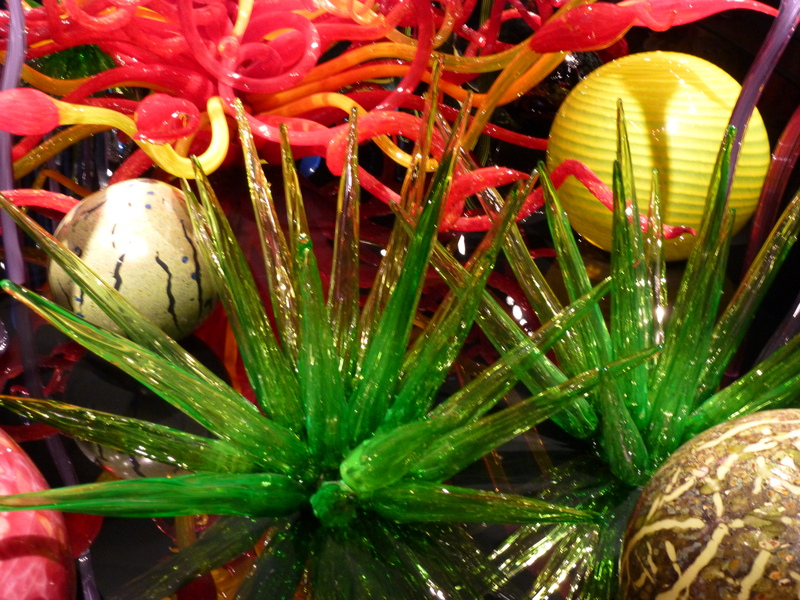 Just when you think you have seen every beautiful thing that could possibly be made of glass; get ready for your head to explode when you see the garden. 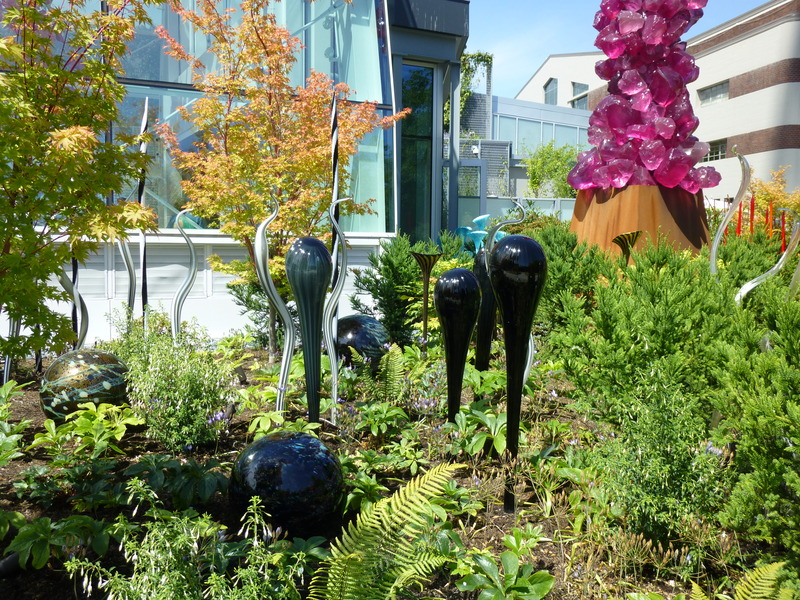 On a beautiful sunny day (they do happen in Seattle) you will think you are in paradise as brilliantly colored glass flora mingles with complimentary species of living plants and flowers. Insane! 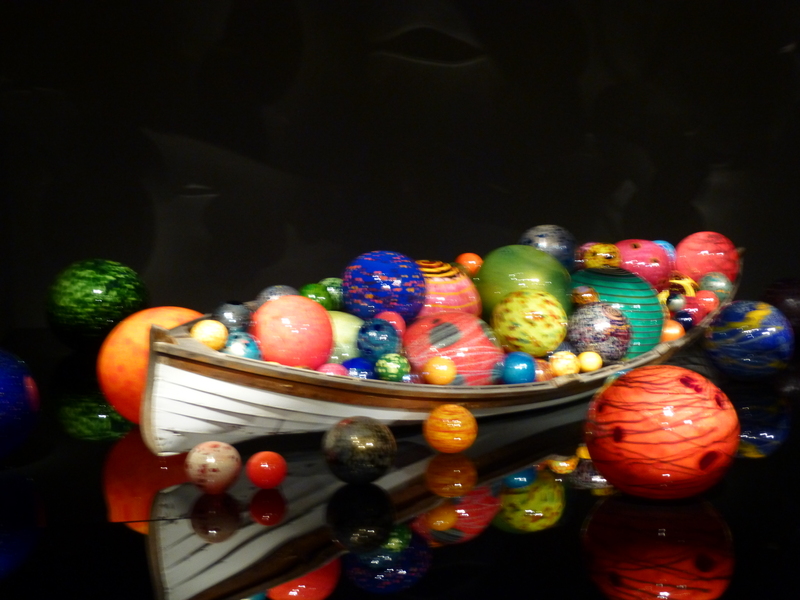 The Worley Gig cannot pile enough praise and hype on Chihuly Garden and Glass as the number one Must See Attraction for residents of and visitors to Seattle alike. We would also like to say a special Thank you to April, the museum’s in-house Head of PR, who was kind enough to not only comp our entry but to also give us a personal tour of the galleries. 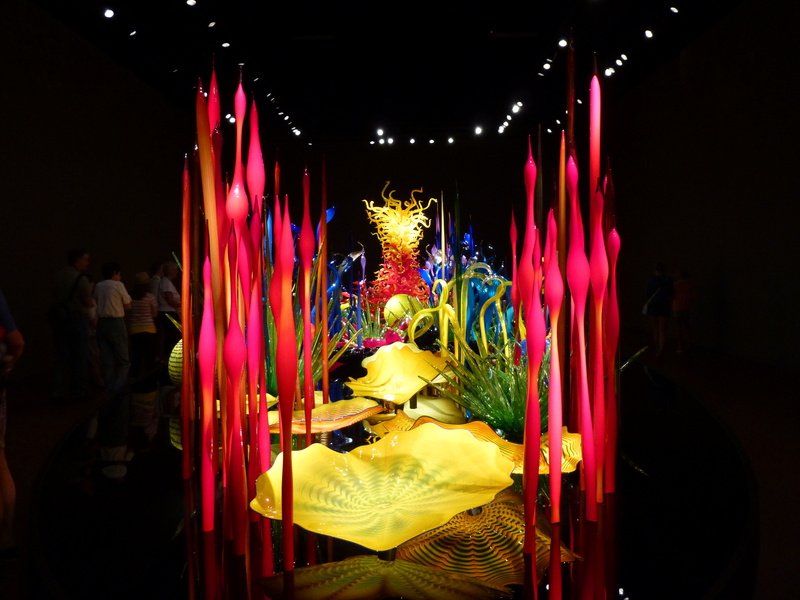 Chihuly Garden and Glass is fortunate to have such a passionate and knowledgeable employee. 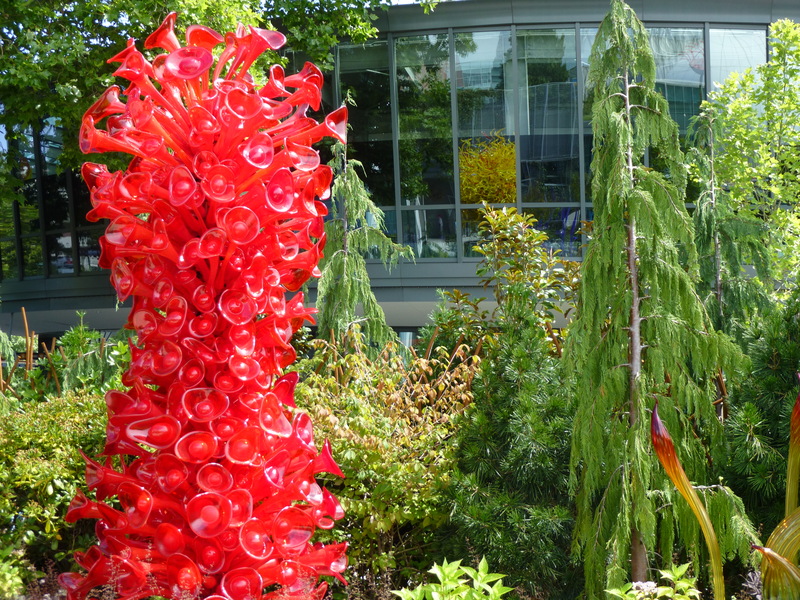 Chihuly Garden and Glass is Located at 305 Harrison St. (right next to the Space Needle and the Seattle Center Monorail Station), Seattle, WA 98109. Open Every Day, Hours are Monday to Thursday 10:00 AM to 10:00 PM and Friday to Sunday 10:00 AM to 11:00 PM. 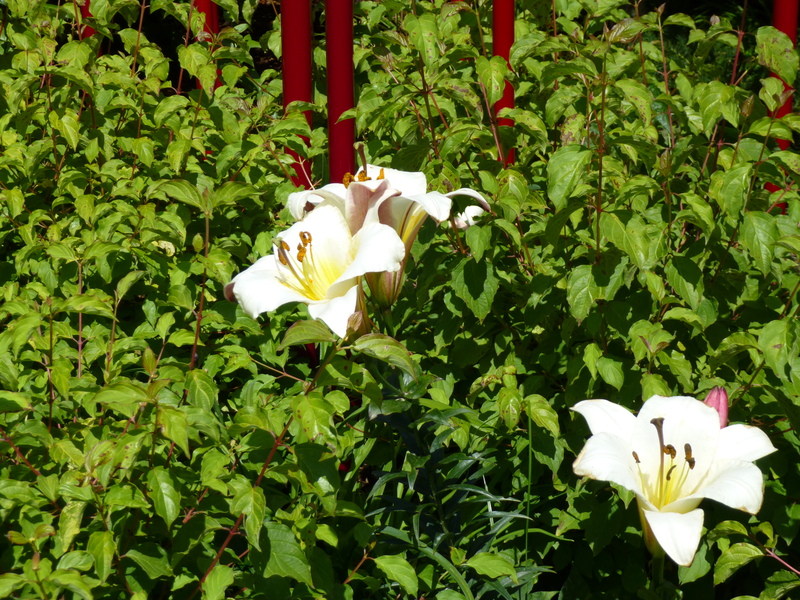 Visit This Link for Admission Prices and Additional Information on Special Events. Looks freakin’ awesome! I love his work! 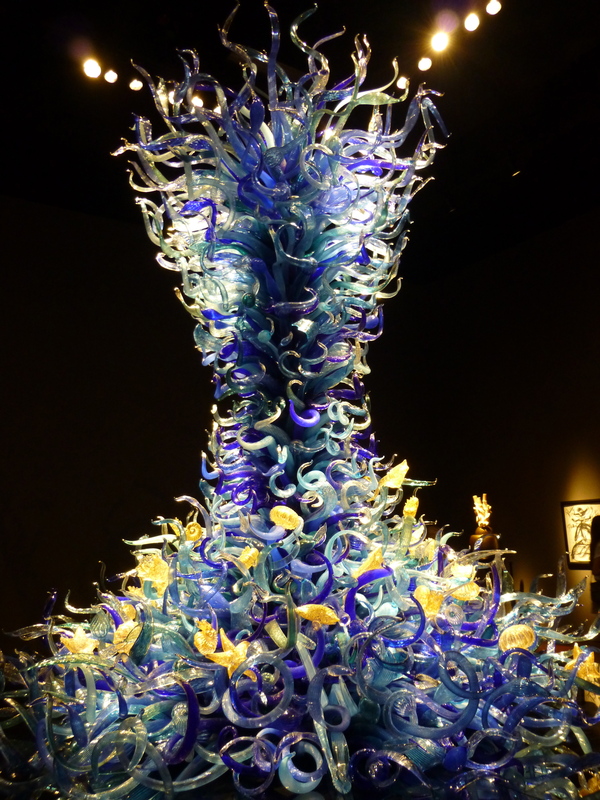 That blue glass sculpture in the SeaLife room looks exactly like the one at Mohegan Sun casino in CT! 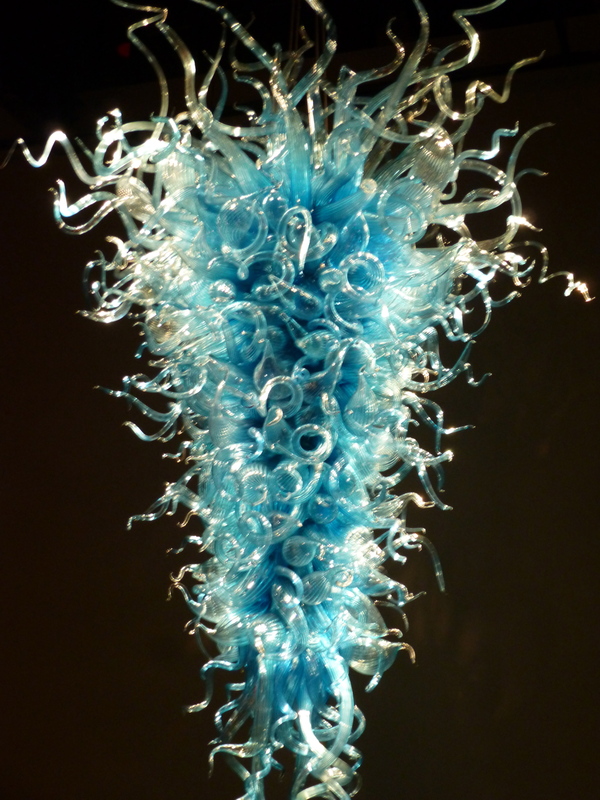 Would love to view more of dale Chihuly’s glass art – very interesting!